Last week saw one-hundredth anniversary of an event which greatly impacted the destinies of Europe and America for decades to come. It passed unnoticed by the media. On March 3, 1918, the Bolsheviks signed a peace treaty with the Central Powers at Brest-Litovsk. Far from sealing the Kaiserreich’s historic triumph in the East, its brutal terms stiffened the resolve of the Entente and came to haunt German representatives a year later at Versailles. After the February Revolution (March 8-16, 1918 n.s. ), the Provisional Government in Petrograd was dominated by pro-Western liberals with strong Masonic connections, notably Alexander Kerensky. London and Paris were justifiably worried about the new government’s prospects. In Washington, however, it was optimistically greeted as a moral boost to the Entente: Secretary of State Robert Lansing declared that it was proof positive that the European war had become one between Democracy and Absolutism. The new Russian leaders’ intention to pursue the war on the side of the Entente was no longer feasible, however. Rank-and-file were increasingly attracted to Bolshevik promises of “peace, land, and bread,” and after the failed July 1917 “Kerensky Offensive” started deserting en masse. By October 1917, after making many blunders which played right into the hands of Lenin and his fellow extremist conspirators, the Kerensky government was in utter disarray. The Bolshevik coup replaced the phantom Provisional Government on November 7, which made Russia’s exit from the war imminent. Only one day later, Lenin signed the “Decree on Peace” heralding Russia’s immediate withdrawal from the war. Leon Trotsky was appointed Commissar of Foreign Affairs. In preparation for peace talks with the German government and the rest of the Quadruple Alliance (Austria-Hungary, Turkey and Bulgaria), a seasoned revolutionary fluent in German, Adolf Abramovich Joffe, was appointed to represent the Bolsheviks. The armistice on the Eastern front became effective on December 15, 1917. It was followed one week later by the opening of negotiations at the fort of Brest-Litovsk, overlooking the Bug, in today’s Belarus. Asked at the outset by Germany’s foreign minister Richard von Kühlmann and his Austro-Hungarian colleague Count Ottokar Czernin to outline his terms, Joffe listed six points based on the Bolshevik slogan of “peace with no annexations or indemnities”. The Central Powers pretended to accept such platform, but with the key proviso that this principle would apply “only in case all belligerents [i.e. the Entente] without exception pledge themselves to do the same.” On December 27, the Germans put the record straight by saying that Poland, Lithuania and Courland—already occupied by the Central Powers—would be detached from Russia, ostensibly in accordance with the principle of self-determination which the Bolsheviks had embraced. The Germans, in the meantime, upped the ante. They invited a delegation from the Ukrainian self-proclaimed assembly (Rada)—which had declared independence from Russia—to Brest-Litovsk, but only after it expressed readiness to supply Germany and Austria with substantial quantities of grain. Impervious to Trotsky’s attempts at stalling, on February 9, 1918, the Germans signed a peace treaty with the Rada representatives, even though the Bolsheviks had retaken Kiev in the meantime and proclaimed their own government. In addition, the military leadership—embodied in Hindenburg and Ludendorff—demanded massive additional annexations, both “to increase Germany’s material power” and to strengthen her borders in case of a future war. Von Kühlmann was horrified but unable to change the outcome. The result was a map which went far beyond the one presented in late December. The overall package reflected the annexationist ambitions of the High Command. Yet Trotsky was concerned—in an astute German’s assessment—with the effect of the proposed treaty on the future of the revolution, rather than with its consequences for the Russian nation: the Bolsheviks “represent Russia to a lesser extent than they do the Revolution.” Trotsky took a nine-day break to return to Petrograd so the Bolsheviks could decide what to do next. There he lobbied vehemently against accepting German terms. He suggested the unusual device of unilaterally announcing termination of the war and proceeding with demobilization, but without signing any peace treaty. At first Lenin accepted Trotsky’s formula of “no war, no peace,” which was presented to the Central Powers on February 10, 1918. Six days later, however, the Germans announced that the war would resume two days later, with open-ended German and Austro-Hungarian advance across undefended Russian lines. Petrograd appeared to be in imminent danger of occupation. Two days later the Bolshevik Central Committee supported Lenin’s resolution that the treaty had to be accepted. Trotsky disagreed and duly resigned; he was replaced by Grigori Sokolnikov. The latter arrived at Brest-Litovsk, authorized to put his signature to whatever was presented to the Bolsheviks. “We are going to sign immediately the treaty presented to us as an ultimatum,” Sokolnikov declared, “but at the same time we refuse to enter into any discussion of its terms.” On this basis the treaty was finally signed on March 3, 1918. To Lenin’s pragmatic mind, signing a “Tilsit truce” and thus preserving the Soviet rule in Russia—which was already an established fact—took precedence over fomenting revolution in Germany, which was yet to happen. In pursuing this objective, he was willing to confront those in his own party and others on the far left, who saw his approach as a stab in the back of the forthcoming German revolution. Lenin’s victory signaled an early compromise which was eventually to lead to the theory of “socialism in one country.” All along, the German authorities hoped that their de facto protege Lenin would prevail in the internal Bolshevik debate. On March 3, 1918, they seemed to have been justified in their expectations: their sealed train investment was yielding dividends at a critical time. The German government and top brass had two strategic goals at Brest-Litovsk. Ending the war in the East, and thus releasing much-needed troops and weapons for a final, all-or-nothing offensive in the West, was one. Gaining access to Ukraine’s foodstuffs was the other. Both were seen as literally existential. After the United States declared war in April 1917, it was obvious to all key players that Germany was in a tight race against time. It would take the Americans a year to build an army, but by mid-1918 doughboys would start arriving in France en masse, whereas Germany’s reserves of manpower were almost depleted. Scoring a decisive victory in the West before that happens, and certainly not later than June 1918, was a military-strategic imperative of the highest order. That required releasing some eighty German and Austro-Hungarian divisions, which were engaged in the East as late as November 1917, and transferring them to northern France and to the Italian front respectively. Just as importantly, it was essential to gain access to Ukraine’s food supplies. By the time of the Bolshevik coup, slow yet deadly effects of the British naval blockade were painfully felt all over the Mitteleuropa. Starting in the fall of 1914, the Royal Navy cut Germany off from sources of many essential commodities and foodstuffs. Three years later the consequences were becoming intolerable. A repeat of Germany’s grim “Turnip Winter” (Steckrübenwinter) of 1916-1917, which claimed tens of thousands of lives, could be endured only if the starving populace could be offered a realistic prospect of an eastern “Bread Peace.” Concluding that kind of peace was also essential if Austria, hungry and demoralized, were to stay in the war. After September 1916, the German General Staff had gained the upper hand over the civilian decision-making structures. In the end it bypassed civilian negotiators and dictated the terms at Brest-Litovsk. The generals had formulated terms that were seen as excessive even by the German civilian negotiators. Germany, Austria-Hungary and Turkey directly detached over 780,000 square kilometers of Russia’s pre-1914 territory, the equivalent of four Great Britains. It was inhabited by 56 million people—a third of the Empire’s prewar population—and it contained three-quarters of Russia’s iron and steel production, 90 percent of her coal mines, a third each of her textile industry, her most fertile agricultural land, and her railway network . . . The Treaty amounted to an audacious German bid to reduce Russia to an inferior status on the periphery of Europe, comparable to her position before Peter the Great. It sought to establish permanent German hegemony in the east European Intermarium. 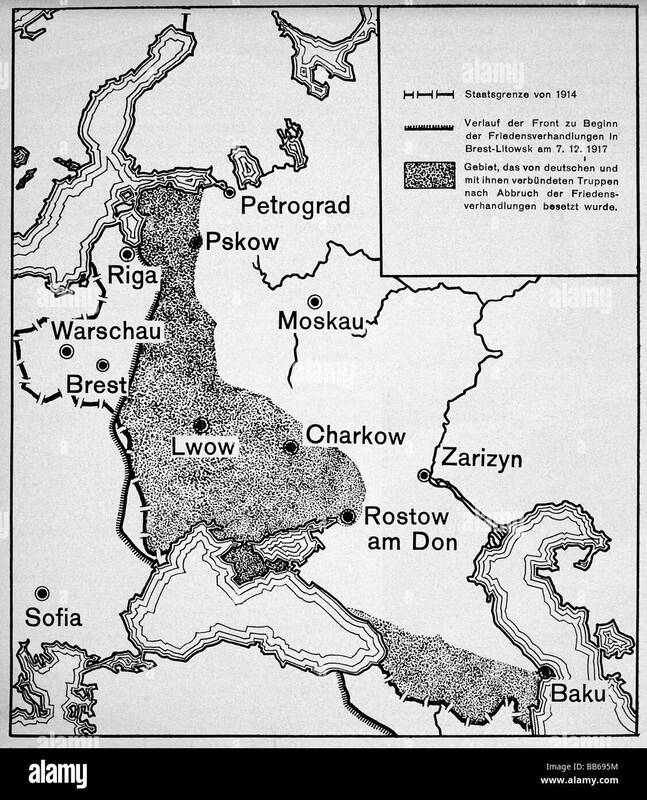 In line with Sir Halford Mackinder’s famous dictum—of which Ludendorff et al may have been unaware, yet acted in accordance with its geopolitical imperative—the goal of Germany’s strategic planners was to control the whole of Eastern Europe, thus to dominate the Eurasian heartland, and accordingly to turn Germany into the dominant power in the world. Excessively harsh terms proved to be the main weakness of the treaty. Huge territorial gains demanded continued presence of large German troop contingents, forty divisions in all, which could have tipped the balance in the critical days of the great spring offensive in the West. In addition, the hoped-for “Bread Peace” yielded little bread, because the German control over Ukraine degenerated into de facto military occupation and forced expropriation of food from the producers. A system of payments in gold or in kind, rather than attempted wholesale robbery of peasants based on worthless paper currency, could have yielded results. Violent grab could not. Just as importantly, probably even more so, in political terms Brest-Litovsk convinced the Entente that no reasonable peace agreement could be reached with Germany. They had no choice but to fight for an outright victory, whatever the cost. The news of the terms imposed by the Germans at Brest-Litovsk spread like wildfire on both sides of the Atlantic. They clearly indicated what would be the consequences of defeat for France, let alone Belgium or Serbia. The impression was profound, resulting in new, unprecedented unity of political and military purpose between the European allies and the United States. President Woodrow Wilson had previously drawn a distinction between “German imperialism” and “German liberalism.” He even declared, in December 1917, that the internal monarchical system of Germany could be retained, provided that the power of the military caste is broken. Wilson presented his Fourteen Points in January 1918 in the spirit of drawing a distinction between Germany’s rulers and her people. Less than two months later—primarily due to the terms exacted by Germany at Brest-Litovsk, Wilson changed his attitude. The treaty’s brutality, the manner in which its acceptance was exacted by armed blackmail, and its prompt ratification by the Reichstag, forced him to conclude that Germany as such had to be beaten.